155 x 235 mm 128 pages, 65 Illustrations, black and white; 128 p. 65 illus. This concise, no-nonsense guide shows students how to adopt a critical approach in order to unlock their academic potential. 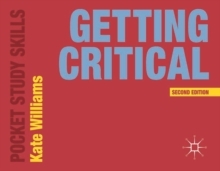 It explains why students need to be critical and provides practical advice on how they can integrate critical analysis into their research, reading and writing. Each succinct chapter is visually engaging and informative, and gives students the support they need to succeed in applying critical thinking to their work. It is an invaluable resource for all students who are required to write essays, reports and other pieces of extended writing as part of their course. It is also an ideal text to be used in conjunction with study skills programmes and critical thinking modules at HE and FE level.